Anyone familiar with the web version of GP Notebook and finds it useful should be encouraged to purchase this app. The overall feel and use of the app is impressive and the ability to access the wealth of content online/offline is a major plus point. 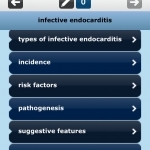 Whilst this app mainly appeals to general practitioners, the information contained within is widely applicable to anyone involved in community healthcare.